The believer of a religion or a sect tries to be saved personally by strictly abiding by the dogmae and rules of the religion or sect. An Arès Pilgrim is saved by his or her personal pénitence and apostolate or harvest of penitents. His or her conscience relies on The Revelation of Arès intead of dogmae and rules ; he or she knows that only practiced Good saves. Which accounts for the Arès Pilgrims' not making up a religion or a sect; they constitute a spiritual movement, which is nothing but a bright rebirth of original Christianity, which they quite simply call spiritual life. The inelaborate salutary spiritual life is what people come and look for in Arès. The simple concern for penitence or Good has driven away from the Arès Pilgrimage a number of complicating matters charac­teristic of religions and their specific pieties and pilgrimages. At Arès no caremony or rite is set, only respect is set. An Arès Pilgrim can unabashedly read the Bible, de Quran, the Veda and other pious books, though he regards The Revelation of Arès as the pure Word, as the sifter that permits the appearance of the Truth from the dark massed matter of a thousand beliefs, for the Truth is hidden everywhere in the sand of the religious desert. Salvation is not found in texts, anyhow, but it is found in a life turned to Good. At Arès it is in the Fire of Good that you will rekindle your faith (Rev of Arès xLi/1-10), which is more than belief, power to change your life (30/11) and change the world (28/7). Human beings of various religions can see differences between them and sound very doubtful as to their likely affinities. An Arès Pilgrim never see the differences between men. All of men yearn for Good. This reduction of various forms of faith to the common denominator which Truth is — Truth is that the world has to change, says The Revelation of Arès (28/7) — is very difficult to explain to the public; our missionaries are well-aware of it. We look like simplistic people without an ounce of personality. When people ask us, "What are you after all? What do you do?" we reply, "Humans of intense spiritual inner made of loving the neighbor, forgiving all offenses, making peace, thinking and speaking with warmhearted intelligence and being free of all prejudices. All this goes off in each Arès Pilgrim's heart of hearts; we call it penitence, because it awakens the image and likeness of the Father (Genesis 1/26-27) deep down, but it is as unseen as Him in the eyes of mankind until His Day comes (Rev of Arès 31/8). What brings us together and gives us power is our shared belief that only Good conquers Evil and saves the individual as well as the world. 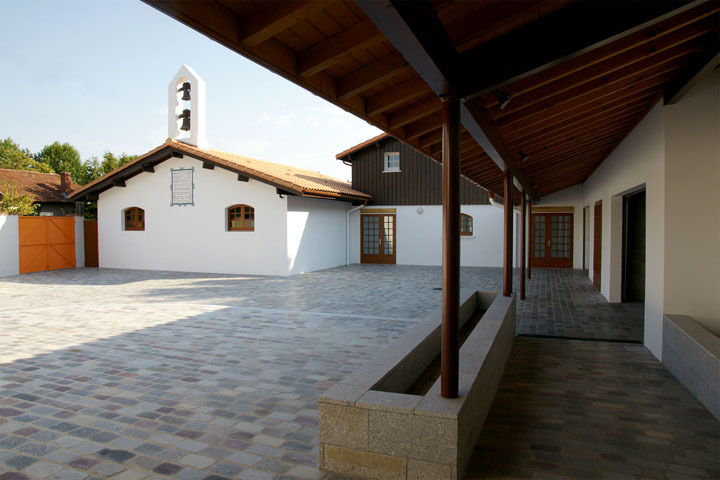 It is only on the Arès Pilgrimage place that you can definitely see something visible and distintive in the Arès Pilgrims: The Place where the Saint appeared in 1977, the pilgrim's tunic and bare feet, his or her prayer or meditation. The Pilgrimage is very important to me, because I sort of live through there what I lived through in 1974 and 1977 when Jesus and the Father spoke to me. It is a sacred time of uppermost refinement and love. It is the same thing to my brothers and sisters of faith, because they are my own witnesses. So to speak the Pilgrimage is the drive to reach Life (Rev of Arès 24/3-5). Whenever people ask me, "How can you be hale and hearty at your age?" I have several answers and among them this, "I go on the Pilgrimage." The Arès Pilgrimage is a special place and time. It has done away with all that religions have exploited in history with their pilgrimages numerous on the planet. Religion makes the believer a wolf, a wolf in its religious pack. The Arès Pilgrimage makes man a man, a man of the whole world, the world that an Arès Pilgrim strives to change so as to spare it the sin of sins (Rev of Arès 38/2). Spiritual life, penitence, Pilgrimage are not actions achieved on top of or off everyday life. An Arès Pilgrim regard them as everyday life. The Arès Pilgrimage aims to give spiritual life and, once spiritual life is gained, aims to make it grow stronger and stronger. and from August 2 to August 15. Each pilgrim prays and/or meditates freely without bothering other pilgrimsss.